Archelon (a giant sea turtle) lived during the Late-Cretaceous Period, sharing its watery domain with ammonites, mosasaurs, huge fishes, and other extinct marine animals. 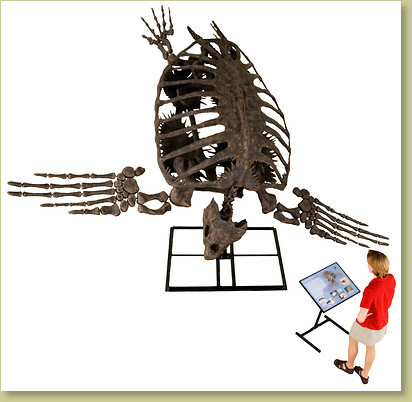 The live weight of this Archelon is estimated to have been more than 4500 pounds! Our replica measures nearly 17' (5.2 m) across from flipper tip to flipper tip. The carapace (shell) is nearly the size of a Volkswagen Beetle! We mount our replica skeleton in a steep diving pose on a single steel support post, or it can be hung from 3 cables. A more horizontal swimming pose is also an option. It is an absolutely perfect emissary to greet the guests at any marine museum or large aquarium, and would be equally exciting in a mix of other species. Want a spectacular draw for your shopping center or amusement park? Our Archelon and your customers will get along swimmingly! Available as hanging or floor mount. The hanging mount can be suspended by cables from three points on the carapace. The floor mount is on a painted steel base. Go to the Archelon Interesting Info page for more on this specimen. Extras Crate construction and packing are an additional $2,250.